"Old Flowers DIe: by Mel Green The Scene... North Beach, Durban, South Africa. A young couple breaking up, observed by a wiser, older man resting, waiting to offer rides on his rickshaw. A friend of the boy awaits the outcome to give his advice. 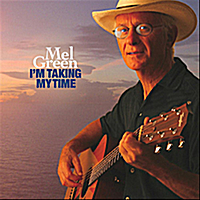 "I’m Taking My Time" by Mel Green: I overheard... “I know where that button belongs” one morning over breakfast at a diner. I made a note and set it aside, until the muse beckoned after I had moved up to Gloucester during a pivotal time... a second chance at life, a realization that every day we have is precious and worth savoring. "Rosie's SIngalong: by Mel Green I’ve always wanted to write a song about the times of my childhood... this song came from an assignment at Bob Franke’s song writing clinics. The process stirred up many precious memories. Only a dream... of a perfect family life... and a favorite audience singalong... go figure? "Desperate Hands (Home)" by Mel Green My emigrant roots are much like many others, except for two stories... my great-great-grandfather who died in Rhode Island in the 1890s... and a 16th century ancestor who changed many laws to prevent bloodshed when his dying employer put him in charge of his Lithuanian kingdom for a day, until a worthy successor could be found. Dedicated to my grandparents who made that journey of emigration. "Always In-Between " by Mel Green About a relationship that went nowhere. I wonder how my kissing friend’s life turned out, and whether she eventually found lasting happiness. A little novella. Big city romance, or perhaps just a soap opera. "All This Time" by Mel Green At last, our paths converged. This one is for my love. "There’s a Light on the Hill" by Mel Green About the miracle of the lights of Chanukah and the fight for freedom against tyranny. A universal story of redemption. "I’m Thinking About Your Eyes" by Mel Green & George Pultz Moonbeams made magic as I drove home late from a band rehearsal on a cool summer night. I didn’t stop at home, but instead drove a few miles further to the beach, where embers of a dying fire, and the ceaseless sounds of the ocean and night birds created a yearning for that someone I had yet to meet... all inspired me with the idea for this song’s creation. "God’s Domain" by Mel Green Most of us live in suburbia, work in cities large and small. We all need beautiful vistas to look out on and clean air to breathe... you, I and every sentient being. "Shadows in the Hall" by Mel Green A story that repeats itself. Lives of quiet desperation. The one’s in the shadows, toiling in obscurity. The forgotten casualties of war, after war, after war. This is dedicated to all warriors, whether voluntary or conscripted and especially those of my own generation that survive, and who are still unappreciated.